I take those data from DatEdit. It show how much "points" you receive from destroying each units. 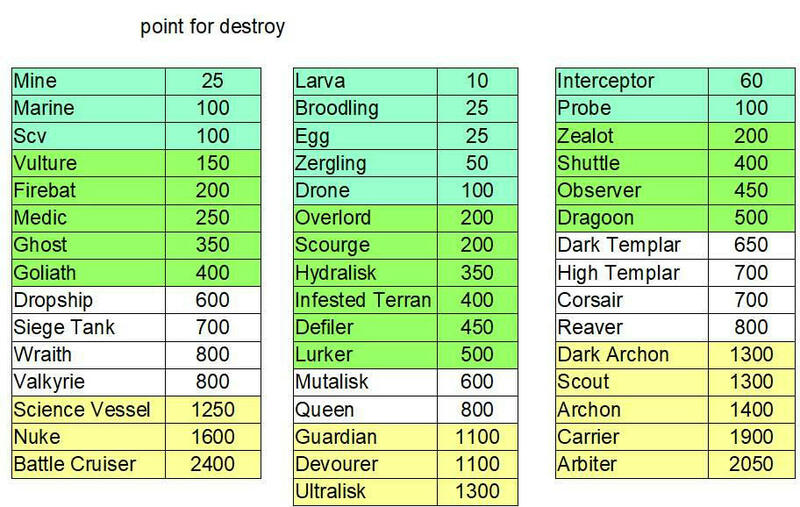 It suppose to reflect the unit value in game (like its harder to kill carrier than zergling, so you receive more points for harder to destroy unit). I find it quite interesting, like travel back in time, insight into developers mind. How powerful would they want units to be. Campaign buildings in particular have very high kill scores. If I remember correctly, the general rule of thumb for kill scores was based on the original unit cost in minerals x 2 + cost in gas x 4 with heroes having a kill score double that of their non-hero counterparts.